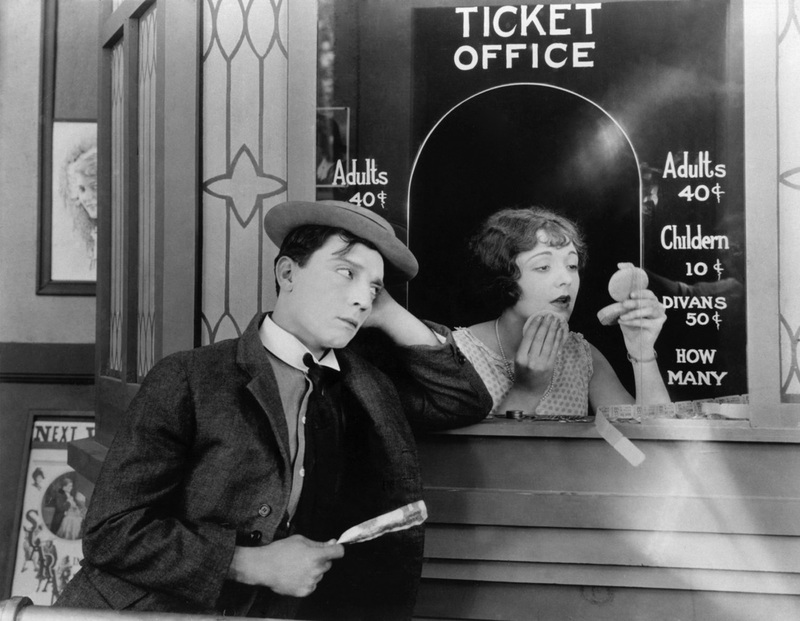 Anecdotes abound concerning the discrepancies between the current critical esteem of the films and their initial box office reception, most famously the fact that The General (1926), now considered Keaton's masterpiece, was initially a box office flop. As the story goes, The General's box office failure caused Joe Schenck to assign a production supervisor to oversee College (1927) and Steamboat Bill, Jr. (1928), but the end result was even lower box office receipts than The General. The graph below shows the U.S. box office performance of Buster Keaton's silent features in millions of dollars, adjusted to current dollars, based on UMR's statistics. The titles are listed chronologically in the graph, so the rising and falling pattern of box office success is clear. Three Ages (1923)--Keaton's first feature over which he had creative control--was quite successful, grossing about 60% more than The Saphead (1920), the first feature in which he starred but for which he was just a hired actor. A good start for his feature career, Three Ages was topped by Our Hospitality (1923), which was one of Keaton's biggest hits, grossing $83M in today's dollars. Our Hospitality was followed by Sherlock, Jr. (1924), now regarded as one of Keaton's best films and by many as a rival to The General as Keaton's masterpiece. Sherlock, Jr. grossed about 25% less than Our Hospitality, and this financial turn might have been one reason Keaton considered Sherlock, Jr. "alright, not one of the big ones." The "slump" represented by Sherlock, Jr. (described on the film's Wikipedia page as "his first real failure after a then 25-year career on stage and screen") was reversed later that same year when The Navigator (1924) became Keaton's biggest hit of the silent era, grossing $94M in today's dollars. After The Navigator, the middle period of Keaton's silent films--Seven Chances (1925), Go West (1925), and Battling Butler (1926)--were a mixed bag in terms of box office reception. The two films based on stage plays were successful, with Seven Chances grossing almost $73M in today's dollars and Battling Butler grossing $81M, but Go West was financially disappointing, grossing less than any of the features before it except for The Saphead. With the financial success of Battling Butler, Keaton embarked on the production of his pride and joy, The General. Overspending his initial $400,000 budget and arguing with Joe Schenck throughout, Keaton put everything he had into The General, but the unfortunate result was a film that grossed even less than Go West, while costing considerably more. The General, in fact, grossed only a little more than half as much as The Navigator, and almost 40% less than Battling Butler. After The General, Joe Schenck took control over costs and, as a result, Keaton's creative freedom. College (1927)--designed to be quicker, less expensive, and more traditional than The General (modeled after Harold Lloyd's The Freshman, 1925)--proved to be Keaton's least commercially successful feature up to that time. This led to Keaton's last independent feature, Steamboat Bill, Jr. (1928), which ironically went over budget due more to Schenck's insistence on replacing a flood with a cyclone than to Keaton's creative ideas. Steamboat Bill, Jr. grossed about 33% less than even The General. 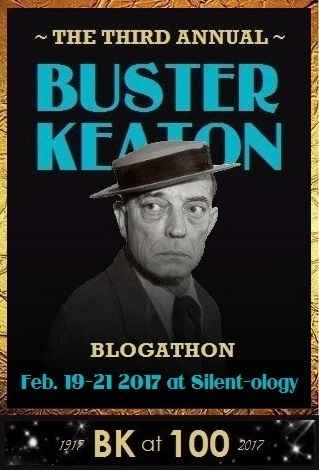 Keaton had to move to MGM for his final two silent features, The Cameraman (1928) and Spite Marriage (1929). While The Cameraman was commercially successful, Spite Marriage was not. Speaking of MGM, let's look at the box office performance of Keaton's MGM talkies compared with the performance of the silent features. The graph shows the silent features in blue and the MGM sound features in purple. It is remarkable how consistently the first four sound features performed, grossing the modern equivalent of between $50M and $60M each. This is close to the average gross of the silent films ($60M excluding The Saphead); while there were no big hits like The Navigator, Our Hospitality, and Battling Butler, there were no disappointing flops like Spite Marriage or Steamboat Bill, Jr. The addition of Jimmy Durante as co-star in The Passionate Plumber (1932) was a financially successful move by MGM (though few would consider it an artistically successful decision). This film and its follow-up, Speak Easily (1932), were some of Keaton's most successful features, grossing more than any of the silent features except The Navigator. The chaotic What! No Beer? (1933), was not as successful as its predecessors. 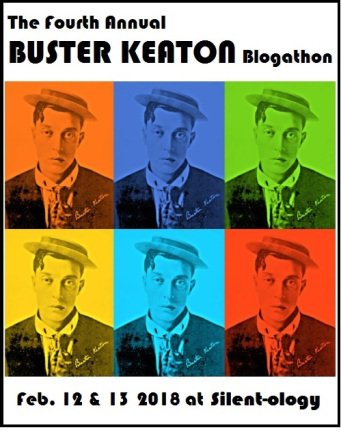 Although MGM had announced a fourth collaboration between Keaton and Durante, the studio fired Keaton for his unreliability and worsening alcoholism, ending his career as a movie star. I thought it might be interesting, just for fun, to compare the box office grosses of Buster Keaton's films with the performance of modern movies. 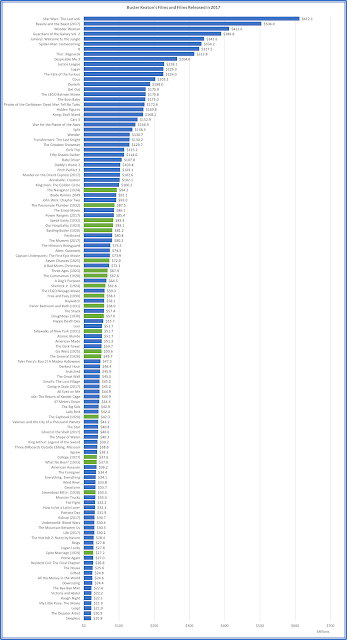 The graph below shows the top 100 movies released in 2017 by U.S. box office receipts, along with the equivalent grosses of Keaton's features (highlighted in green). Please click the graph to view it at a larger size. If we compared the equivalent box office grosses, then Keaton's most successful film, The Navigator, would rank just below Kingsman: The Golden Circle and just above Blade Runner 2049. Keaton's lowest grossing feature, Spite Marriage, would rank about the same as Logan Lucky and Home Again. Coincidentally--especially given the stormy subject matter--Steamboat Bill, Jr., one of Keaton's biggest commercial flops, grossed about the same amount in equivalent dollars as Geostorm, one of 2017's biggest commercial flops. 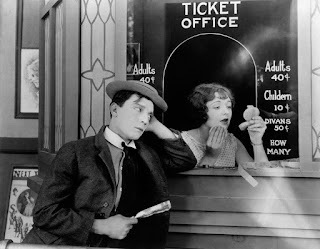 It would be ridiculous to assert that Buster Keaton's films can be understood or appreciated by looking at box office receipts, but I think that analyzing the commercial success of his films can add context to his filmography and his biography. This is most obvious when we look back at masterpieces like Sherlock, Jr., The General, and Steamboat Bill, Jr.--a trio of movies that grossed on average $48M in today's dollars, less than Go West, Battling Butler, and Seven Chances. It's also obvious when we look at the sound films pairing Keaton with Jimmy Durante, films that are now dismissed as inferior but which were far more commercially successful than the films that are considered masterpieces.